About four years ago, I was introduced to him. A friend dropped off three books at my house while I watched VH1’s Best Week Ever. I knew the friend, it was the author of the books he brought that I was being introduced to. 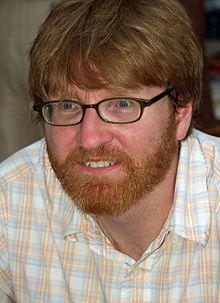 Chuck Klosterman was his name. In fact, it’s still his name. I didn’t read the books. They collected dust on my shelf for the better part of these last four years until I moved out the final remnants from my parent’s house. Then, I read two of the books and some articles. After that, I can safely say Chuck Klosterman is the best writer of his generation. Or, perhaps, he’s not. But, maybe that’s what makes him exactly that. The generally held belief is that Klosterman represents the forward-thinking, progressive bourgeoisie class of middle American males in contemporary society. But, the opposite is actually closer to the truth. Klosterman represents everything we don’t represent, pointing out the most meta details of things we take for granted. Does the Lakers/Celtics rivalry represent every great divide this country has ever seen? How different is Marilyn Monroe from Pam Anderson? Is there a limit to how many footnotes an article can have before you’re officially distracted? How detached can someone be before they are officially considered aloof? What is it about Billy Joel that makes him so patently uncool? When did The Real World stop being about the real world and when did the real world stop being about The Real World? Is there a difference? Are you confused yet? These are just some of the questions pondered by Klosterman, all done in painstakingly plain style and writing. * Writing, mind you, that somehow comes off as both intrinsically humorous and, yet, at the same time, mind-blowingly honest. Reflective, but intelligent. Well-crafted, but allergic to peanuts. Intentioned and simultaneously, both mundane and amoral. After finishing his Decade of Curious Decisions, I put a call into Klosterman’s office looking to get a comment for this article. *** He did not respond. But maybe, that’s precisely what he wants. You see, Klosterman’s elusivity is what builds his base. It’s a reactionary tendency we all have to fear what we don’t know, like I’d imagine the Winslow family felt when Steve Urkel first came into their lives. Or, when Mos Def released anything after Black on Both Sides****. But, like most things, the true meaning and importance of Klosterman lies somewhere in the vast middle. The happy medium of discourse that informs those of us in this super-powered information superhighway generation. He’s both a refined scholar documenting topics that interest he and his all-consuming public and a sailor-pirate pilfering the youth of time and enjoyment with verbal dexterity and extremely specific societal references they’ll feel stupid for not understanding. How The Fugees breaking up was the first episodic example of real-life disappointment for the white, middle-class Americans that purchased their records in the early-to-mid 90s. Some how, by the end, you find yourself convinced of his point. Or, exhausted. You’ll laugh, that’s for certain. And, you will find yourself enlightened on some level. But more than anything, I’d imagine you’ll just be confused. Or, perhaps, you won’t be. ***This is definitely not true. ****Any fan who says they do not understand this reference simply isn’t a fan. Or, is a cyborg from Terminator. One way or the other, that person simply cannot be trusted.